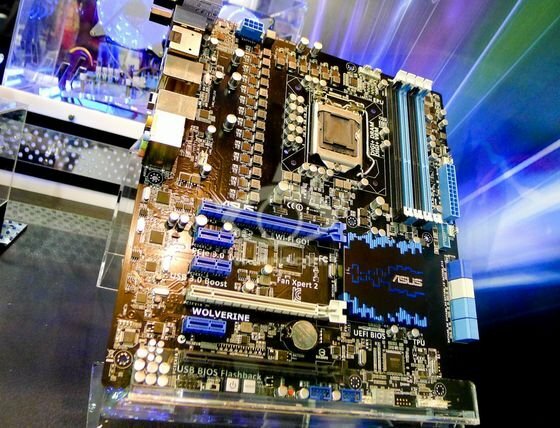 VR Zone published a couple of photos of the ASUS Z77 Wolverine, a prototype motherboard that looks a lot like the P8Z77-V but with 40-phase power design! Annoyingly, silkscreen markings of the drivers and PWM controllers used were blacked out but it is certainly a radical departure from the usual DIGI+ VRM design. Time will tell if ASUS will (re-)adopt the marketing friendly "MOAR PHASES IS BETTER" metric approach, which is silly as there will be a diminishing point of return really. For example, the ROG Maximus V Gene implements just 8+4 beefy phases, but that didn't hinder its prowness in claiming most subzero overclocking records.